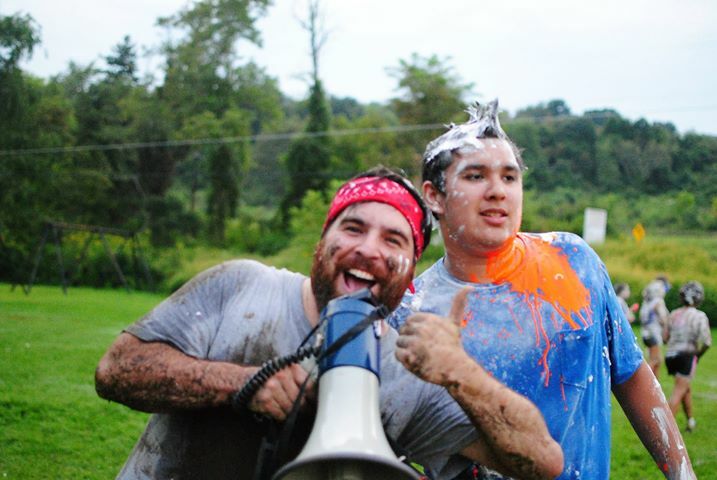 Paint, Flour, Mud, Mayhem, and More! Call in your local volunteer fire department and ask them to hose down your field. (Ours came by and hosed 2,500 gallons of water onto our field). You're going to want to schedule this in advance. When all the students have arrived, gather around for a "before" picture. Then, tell the students it's time to get muddy and have them roll/slide around in the mud (prepare the leaders ahead of time so that this doesn't surprise them and they can be mentally ready to enthusiastically roll around in the mud). Split the group into two teams. One on each side of the field. At the start of every round the two teams will charge at each other meeting in the middle and throwing their elements at each other. Each round will have a different "element." Between each round, pump the students up and get them psyched for the following round. Play music the entire time (preferably loud, high energy Christian Hip Hop). Consider investing in a megaphone too. When you prep the oatmeal, make sure it's watery enough that student's can't clump it into a hardened baseball that can do damage. To make paint balloons we purchased water balloons, Neon Tempera Paint from Walmart, and water bottles with sport nozzles. Then we combined 1 part water and 1 part paint into the water bottles, shook it up and then squeezed it into waterballoons. We made our paintballoons smaller than our water filled balloons so that we could save money. We ended up buying 25 bottles (16 oz each or 1 pint each). We lost count of how many balloons it made but we had 25 students participating and at the beginning of the round they wielded two paint balloons each and then went back for more. So it was plenty. We set up a ladder (for aerial shots) and my wife took pictures and a volunteer took video (so we could make a promo for next year). Plan on hosing kids off afterwards. We locked our youth room and sealed off carpeted areas of our church. Consider doing the same. Here's some awesome pictures my wife took.